Over the years, Standard of Excellence TOF (Stan), has proven time and again he is a stallion that can produce. Along with being an 80 point Silver stallion, National Grand Champion Stallion (2003), has been the Stallion Incentive Program champion, won the prestigious Dressage at Devon breed class, received three 10’s at his Disposition and Trainabilty Assesment, his offspring are equally talented. In 2007 Standard produced the winning foal of the AHR’s SIP Futurity and had all his foals in the top six in the class of 15 foals. In the National Filly Futurity his fillies stood 1st and 2nd. In 2010, Stan’s offspring won three of the four Championship classes. This year, 2015, his foals won the Yearling Class (Miranda PHHF), three year old Driving class (Holly of Excellence HOF), three year old Riding class (Melody of Excellence HOF), with Melody being named the Three Year old Champion. Standards colts stood four and five in the Senior Weanling Class. We can identify Stan’s foals by their outstanding personality and desire to learn. Standard of Excellence ("Stan") is the son of Standschutz out of Bluml. He was selected second in the annual yearling selections in Ebbs, Austria, with the same number of points as the first place yearling, Straden. Straden and Stan are 3/4 brothers. Straden continues to be the top ST line stallion in Austria. Stan was inspected and classified in 2003 with 80 points, the third highest classified stallion in the American Haflinger Registry. Standard of Excellence TOF was named the 2003 National Grand Champion Stallion. In 2004, Stan's filly foal was the winner of the National Show Yearlings and the AHR Yearling Futurity. In the fall of 2008 we worked out a lease agreement to stand "Standard of Excellence" on our farm for the 2009 breeding season. After having him on the farm for awhile we fell in love with him and bought him from Tudor Oaks Farms prior to the 2010 breeding season. We are now the sole owners of the exceptional stallion. Standard's offspring have done very, very well at the Futurities. Please phone or e-mail about the availability of a specific cross and current pricing. All foals are eligible for the HOPE Futurity. Please feel free to call Robert and speak to him about your needs. 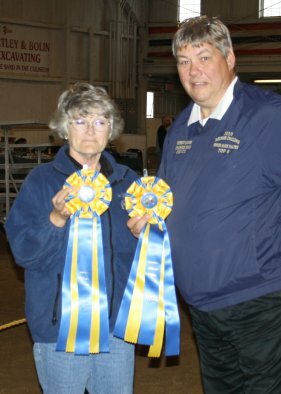 This photo was taken at the AHR Futurity 2012 in Ashland, Ohio. The horse on the left is Standard of Excellence after winning the AHR SIP Stallion of the Year in both the Pleasure side and the Draft side. Quite an accomplishment! 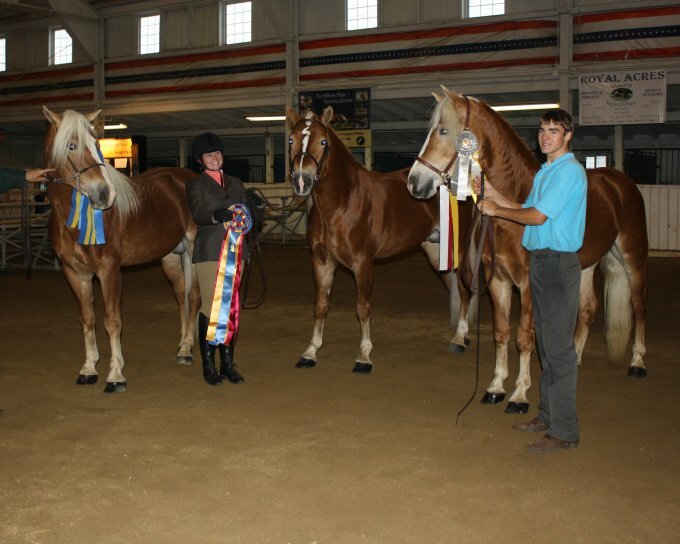 The middle stallion is Stelaka (Grand Champion Stallion at the Buckeye Show 2012) Standard's son, and the horse on the right is Stamp of Excellence, also a Standard son (Reserve Champion Stallion at the Buckeye show 2012). Stamp will be leaving in 2013 to begin his stallion career in Australia, courtesy of Rosymoon Haflingers, Kerrie and Phillip Rosetta. This is probably the only opportunity we had to get the three of these stallions in one picture. An impressive "family" photo. 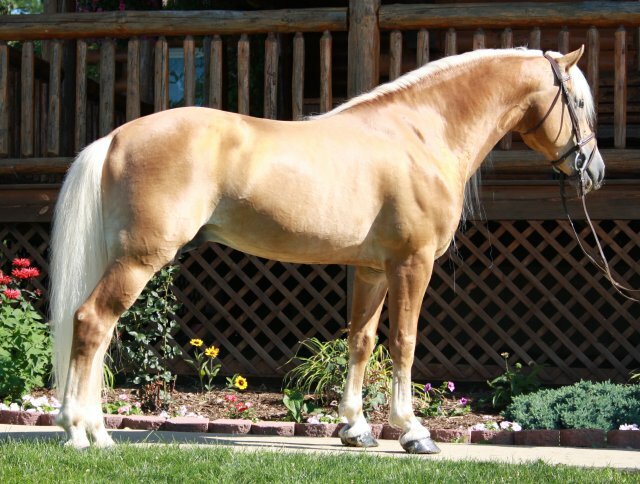 At the end of the 2012 American Haflinger Registry Futurity, Standard of Excellence was awarded the Stallion Incentive Program’s “Stallion of the Year 2012” in BOTH the Pleasure side and the Draft side. Photo is Susan Van Horn, DerHaflingerhof and Chuck Hendershot accepting awards.